What Pet Shampoo Should You Buy? At a glance, dog shampoos are generally safe and will give your dog the clean coat you desire, especially if they like to cuddle with you on your bed. A good smelling dog, however, doesn’t always mean they’re happy. If your dog has extremely sensitive skin, washing them after they’ve gotten in a mess can cause them to have itchy skin and may cause them pain. Because we want your pup to stay clean, happy and healthy, our veterinary hospital has put together a list of the most recommended dog shampoos available over the counter. We get it; your dog may be as happy as a clam walking around caked in mud and dirt, but as a dog owner, we know you’re not! Here is a list of the top rated shampoos and conditioners you’ll want to try out on your dog the next time they get into trouble. 5. Earthbath Oatmeal and Aloe ConditionerSchedule an Appointment Today! Why should you avoid using human shampoo on your pup’s fur coat? Many dog owners have done this, or have definitely thought about doing it when desperate: Simply using human shampoo and conditioner on their dog’s fur coat to get them clean instead of specialized pet shampoos. Although using human shampoo won’t do your dog a lot of harm, frequently used human products on your dog can cause them to develop conditions and allergic reactions; plus, it won’t do their coat or skin any favors because theirs differs from human hair and skin. Your dog has different skin pH levels than you, and a human shampoo is generally made to be acidic to best clean our skin effectively. Humans usually have a pH level of 5.2 to 6.2, whereas dogs have alkaline skin pH up to 7.5. This difference means that, if you use a human shampoo on your pooch, they’ll develop skin problems and will me more vulnerable to parasites and bacteria. 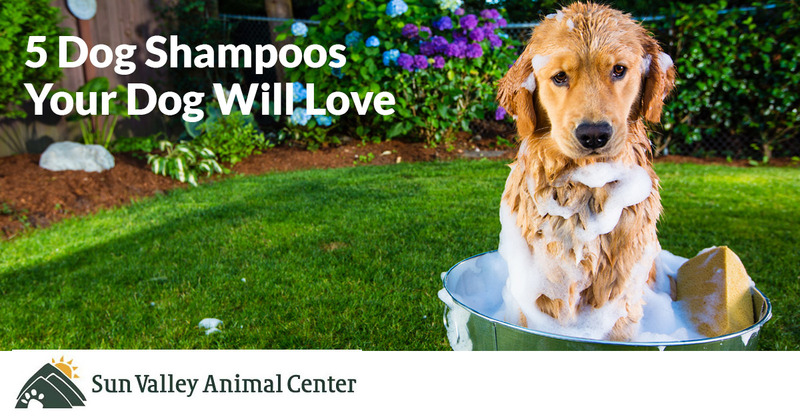 So you decide to use the human shampoo and conditioner on your dog anyway… well, what happened? Did you dog start scratching their skin nonstop? Dogs generally have much more sensitive skin than humans and this means that it’ll dry out from harsh chemicals or products, leading to dryness, abrasions and scratching. If you do have to bathe your dog to get mud or a nasty smell off of them, use only water the first time around. It’s better to rinse your dog with clean water than with a soap that can be detrimental to them; if you don’t believe us, give our veterinary hospital a call. We will gladly answer any questions you may have. In the meantime, head to your nearest pet store to stock up on a pet shampoo your dog will enjoy. Did you know that each breed is different? Therefore, each breed of dog has a different recommendation? Plus, it depends on your dog’s lifestyle. If your dog likes to play in the dirt all the time and wrestle with their buddies, they’ll need a bath more often than an old dog who lays on the couch all day or basks in the sun that shines through the window onto the floor. Generally speaking, a dog that spends most of their time indoors should get a bath every two to three months. A dog that is double-coated, such as a Lab, should really only get a bath every three months or so. And a dog that is very active should be given a bath every six weeks. Want to learn more about dogs and our recommendations if you’re a dog owner? Stay tuned for our next blog post!